This past week I did a phone interview with Jeff Mauro, last season's Food Network Star for an article for a regional newspaper. Earlier this month, the third season of his show Sandwich King kicked off and his new series $24 in 24 premieres on Monday evening at 9:30 PM/CT, with a preview show tonight in his hometown of Chicago. I'm interested in seeing where he ended up...because after the interview, I realized I didn't even question him about where he went in the Windy City. The premise of the show is similar to the show that Rachel Ray had on the Food Network, $40 a day. 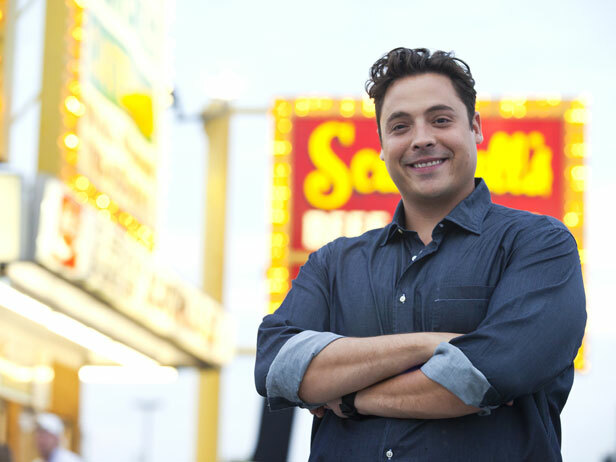 Mauro visited seven cities during taping and in each one, he had $24 to spend in 24 hours on three meals and a snack. This show has more limitations that Ray's had and he noted that they didn't go over budget once. I recall a few shows where Ray went over by a buck or two. When the full story I did runs, I'll post the link on my Facebook page. I'll let you in on one surprise I heard from him. When I asked him what city had the best bargains on food, I was shocked when he said New York. He cites the tremendous competition with keeping prices down. So, tune in tonight to check out the Chicago episode! I wish I could list a specific time...but I don't have that info in my notes and my television guide has "to be announced" in the time slots from 7 to 8 p.m. and from 9 to 10 p.m. So, I'll try 7 p.m. and see if it's on! On Monday, he hits Cleveland.